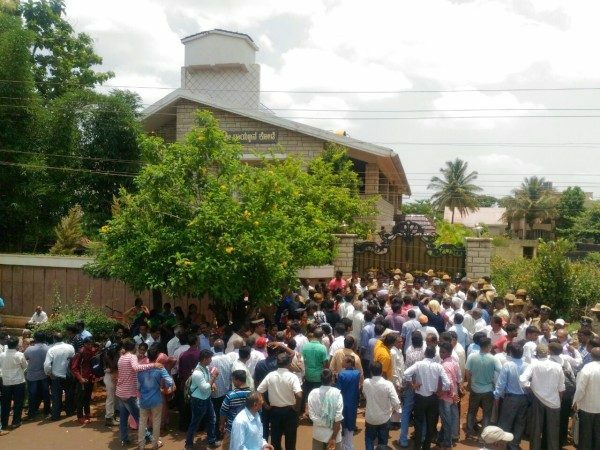 Thousands of depositors who have been going from pillar to post to get their money back which they have deposited in the Sangolli Rayana Co-op bank gathered infront of the house of Chairman Anand Appugol today at Hanuman Nagar Belagavi. Anand Appugol the Chairman of Shri Krantiveer Sangolli Rayanna Co-Operative Credit Society was not able to return the deposits even after maturity and the amount is the tune to Rs.300 crores and is out on bail after being in jail for 3 months. The depositors were heard shouting and asking Appugol to come out of his house and return their money. The police led by DC P Seema Latkar visited the spot. Previous articleIs SpiceJet going to discontinue its only flight to IXG from July ?